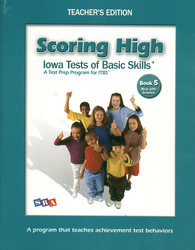 Help your students prepare for the newest version of this test with the most recent edition of Scoring High on the ITBS. The teacher's edition contains updated questions, format, and content areas to help prepare students. Two color, soft cover book with mini student pages and answers. Also includes a "tips" poster.